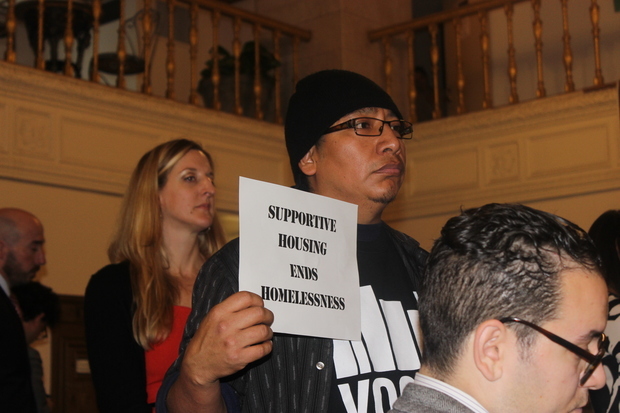 A supporter of Mayor Bill de Blasio's $2.6 billon plan to build 15,000 units of supportive housing for homeless New Yorkers over the next 15 years. TIMES SQUARE — Saying the city could no longer wait for Gov. Andrew Cuomo and the state to act, Mayor Bill de Blasio announced a $2.6 billion plan to build 15,000 units of supportive housing for homeless New Yorkers over the next 15 years. "We are acting decisively. We are not waiting on Albany," de Blasio said Wednesday before a supportive crowd at The Times Square, the single largest supportive housing residence in the country. The announcement comes as de Blasio continued to face criticism about the high number of people in the city's homeless shelters. The plan will cost the city $1 billion in capital costs. All but $380 million has already been budgeted for in the city's "Housing New York" affordable housing plan. The rest of the money — $1.6 billion — will be gathered through private developers and low income tax credits. The city will also pay $96 million in operating costs through fiscal year 2019, starting at $8.8 million next year when de Blasio said he expects to see the first units come online. The proposal comes as housing advocates were trying to get the city and state to agree on a new supportive housing agreement called NY/NY 4. Homeless and housing advocates had requested 35,000 units of supportive housing statewide over the next several years with an expansion to help families, homeless youth and domestic violence victims. Roughly 25,000 of those units would have been in the city. Cuomo proposed a total of 5,000 units statewide, 3,900 of which would have been in the city. De Blasio's plan, which includes 7,500 units of newly constructed housing and 7,500 scattered site units, surpasses that. Asked about assertions from the state that the city needs to do more, de Blasio replied: "The city just did more. It speaks for itself." The announcement of this plan is just the latest in the long-running and very public feud between Cuomo and de Blasio on a myriad of issues. It also places the ball in Cuomo's court, said advocates. "Today's announcement needs to be part of a fourth NY/NY agreement," said Mary Brosnahan, president and CEO of Coalition for the Homeless. "We need Gov. Cuomo to step up and match this." Manhattan Borough President Gale Brewer agreed. Cuomo's office did not respond to a request for comment. The number of homeless people in the city's shelters currently stands at approximately 58,000, according to the most recent Department of Homeless Services census, slightly down from a high of 59,000 in December. De Blasio previously blamed the media and public perception for the idea that homelessness was on the rise before finally acknowledging a problem. Housing advocates and the mayor said that supportive housing is one of the best ways to combat long-term homelessness, especially for the mentally ill and drug addicted. Each unit costs the city approximately $30,000 per year, tens of thousands of dollar less than the cost of housing an individual in a shelter. But each open supportive housing slot currently has five applicants. "This is the answer," said de Blasio. "People should embrace this answer." Wanda Hernandez Parks, chairwoman of the board of directors for Vocal New York, praised what she called the "most-needed" plan in the city. "I do wish the governor would put a little more effort into it," said Parks. "Like the mayor said, we can't wait any longer."